A wonderful city to call HOME! When you commune with nature, your daily stresses and strains will quickly fade. Explore the Cuyahoga Valley National Park (Ohio’s only national park and among the Top 10 Most Visited in the U.S.), featuring more than 33,000 acres to hike, bike, ski, sled and simply unwind. Summit Metro Parks offer 14,100 additional acres with 16 parks, several conservation areas and more than 125 miles of trails and 2 miles of the Ohio & Erie Canal Towpath Trail. Iconic attractions, Stan Hywet Hall & Gardens and Hale Farm & Village extol their surroundings, offering manicured gardens and open vistas. The Akron Zoo also offers a glimpse into the habitats of creatures large and small. Whether you enjoy the art of cooking or prefer to savor a delicious dish prepared just for you, Summit County has a menu sure to please. Find the freshest ingredients at Mustard Seed Market & Café to make your favorite recipes exceptional. Want to avoid the kitchen? Enjoy nostalgic car-side service at Swenson’s Drive-In. Hundreds of eateries, diners, restaurants and grilles are located in every corner of Summit County, so pack a big appetite. Did we mention Harry London Chocolate Factory? 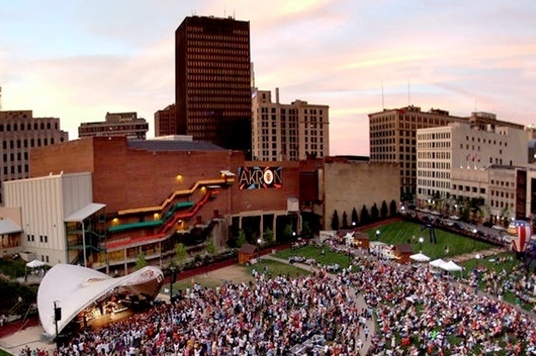 Visual, musical and theatrical — Greater Akron is the stage for sensational cultural pursuits. The expanded Akron Art Museum houses an eclectic modern collection. One block away, Summit Artspace is home to more than 40 arts organizations and features gallery space, studios and classrooms. Stunning spaces — Akron Civic Theatre, EJ Thomas Hall, Greystone Hall, Blossom Music Center and Lock 3/Lock 4 provide year-round access to performances large and small. Greater Akron boasts seven community theaters with inspiring and entertaining seasons. The world-renowned Cleveland Orchestra makes Blossom Music Center its summer home, while the Akron Symphony Orchestra, Tuesday Musical Association, Summit Choral Society and Ballet Theatre of Ohio dazzle audiences during every season. The shopping forecast couldn’t be brighter. Akron and Summit County have fabulous and unique shops with special finds for everyone on your shopping list, including you! The only limit on your fun is that placed upon you by your credit card company. Summit Mall and Chapel Hill Mall are each anchored by top retailers. Specialty shopping is abundant throughout the county including: Highland Square, Hudson’s First & Main, Macedonia Commons, Downtown Akron, Northside District and Peninsula. Akron-centric must-sees are Don Drumm Studios & Gallery, Quaker Square, and Stagecoach Antiques. Greater Akron continues to play a proud and influential role in nurturing vibrant centers of commerce, education and culture in northeast Ohio. These initiatives rest upon our solid heritage. As early as Sojourner Truth’s 1851 “Ain’t I A Woman” speech, our community has been a melting pot for ideas, customs and forms of expression. Visit the birthplace of AA with a tour of Dr. Bob’s Home and the gate-house at Stan Hywet Hall & Gardens. Travel back to the mid 1800s at Hale Farm & Village. Numerous sites, mansions and homes also underscore poignant stories from our rich and lustrous past. Moving to a new home is a big change – especially when it’s in a brand new city. I am here to help make that move as stress free as possible, helping with information on school, communities, entertainment, places of worship and getting your settled in the perfect home for you and your family.